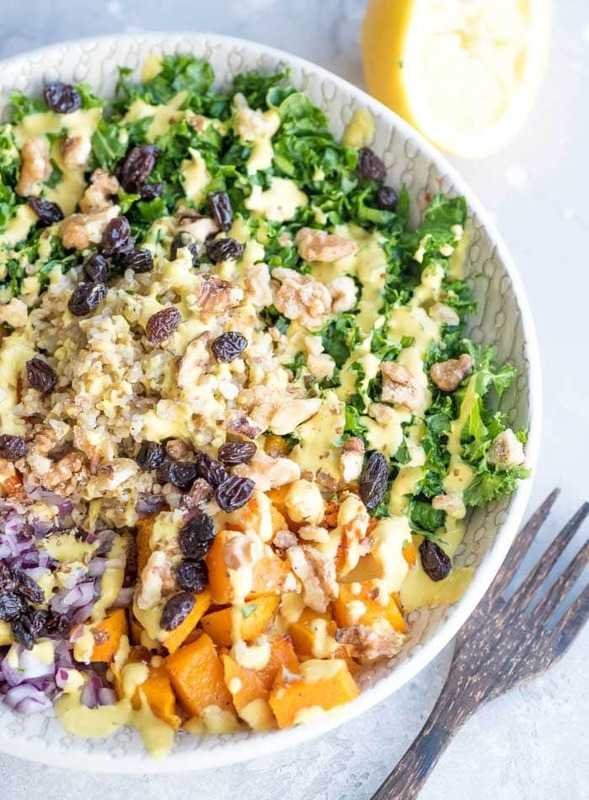 This healthy, vegan butternut squash freekeh salad features delicious roasted butternut squash, kale, raisins, walnuts, kale, red onion, roasted red pepper and a creamy turmeric tahini dressing. Freekeh is a type of wheat so while it’s gluten-free it does provide plenty of minerals, vitamins and fibre. This salad makes an easy vegan lunch or dinner and you can make it in advance for quick weeknight meals. For a gluten-free option, swap out the freekeh for brown rice or sorghum. You can also try another wheat variety such as barley, bulgur and farro. Freekeh, sometimes called farik, is one of my favourite grains. You can read about the rest of my favourites in my guide to whole grains. As for freekeh, I love it’s chewy texture and nutty, earthy, flavour. Freekeh is wheat that’s harvested when it’s young and green. It’s firm, chewy kernels are perfect in soups and salads and they provide a ton of nutrition. Bright, beautiful and nutrient-packed, you gotta love roasted butternut squash. I kept it simple and oil-free and roasted it with a pinch of sea salt and pepper. Roasted until tender and slightly browned, it might be the best part of this salad. If you’ve got some, use them in my Roasted Squash Salad with Marinated Chickpeas. I wanted little sweet bites throughout this salad so I added raisins. You could switch it up with chopped dates, chopped dried apricots or dried cranberries. For crunch and some healthy fats I added walnuts. Walnuts are also one of my favourite nuts for nutrient due to their omega-3 fatty acid content. Alternatives include chopped pecans, hazelnuts or almonds. 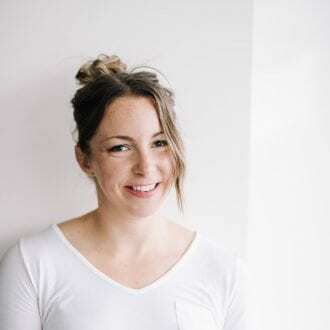 Check out my guide to stocking a vegan pantry for more options such as hemp seeds or sunflower seeds. I think all salads should have at least some green in them. I usually go with kale since it’s sturdier than spinach or lettuce so it keeps well. Thanks to the kale, this salad is a good option for meal prep. 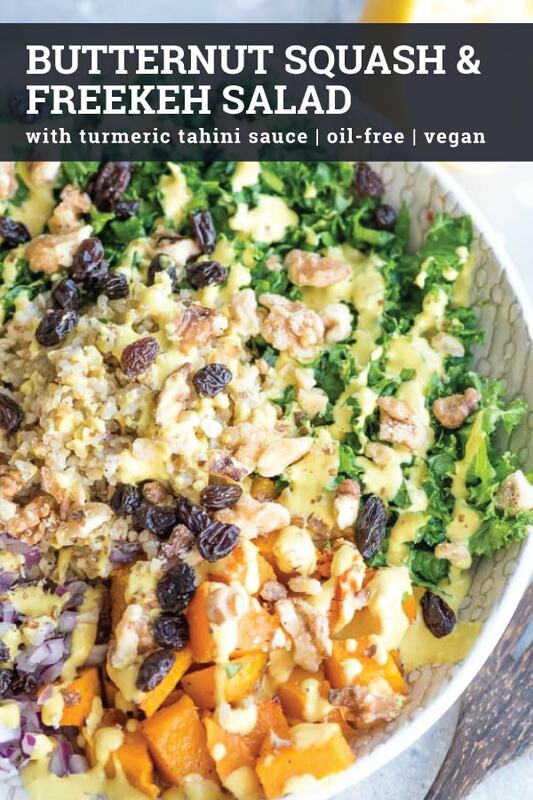 If you’ve been a friend of Running on Real Food for a while you know tahini is one of my favourite ingredients. 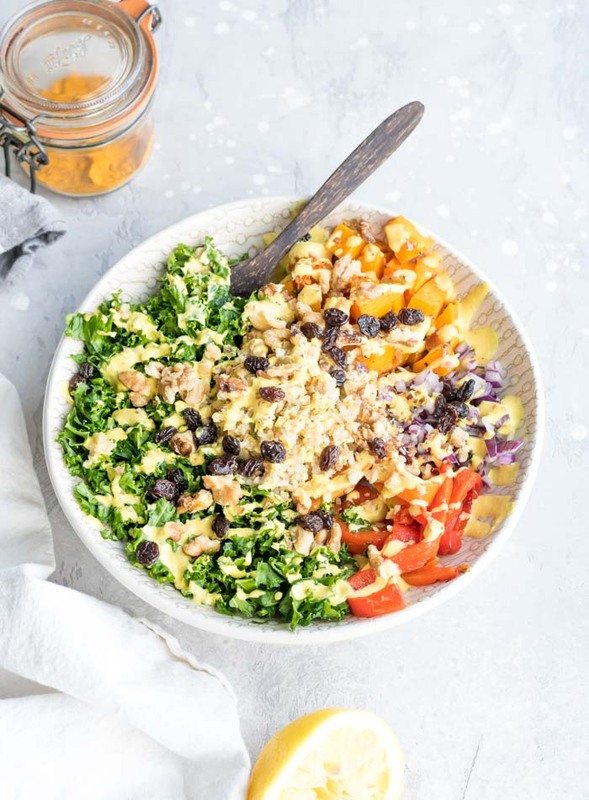 Paired up with turmeric, lemon, maple syrup, garlic, apple cider vinegar and sea salt, it makes the delicious creamy dressing for this salad. The turmeric is optional but I love the colour and nutritional benefits it adds. I added a bit of diced red onion for a tangy bite. While you could just use diced red pepper, I find roasted red peppers take any salad to the next level. They’re so good in this one combined with tangy red onion, crunchy walnuts and roasted squash. Roasted red peppers are very easy to make at home. You’ll find my how-to in the instructions. mix it all together and you’re done! You can mix it up as one big salad or divide the ingredients to make 4 buddha bowls. 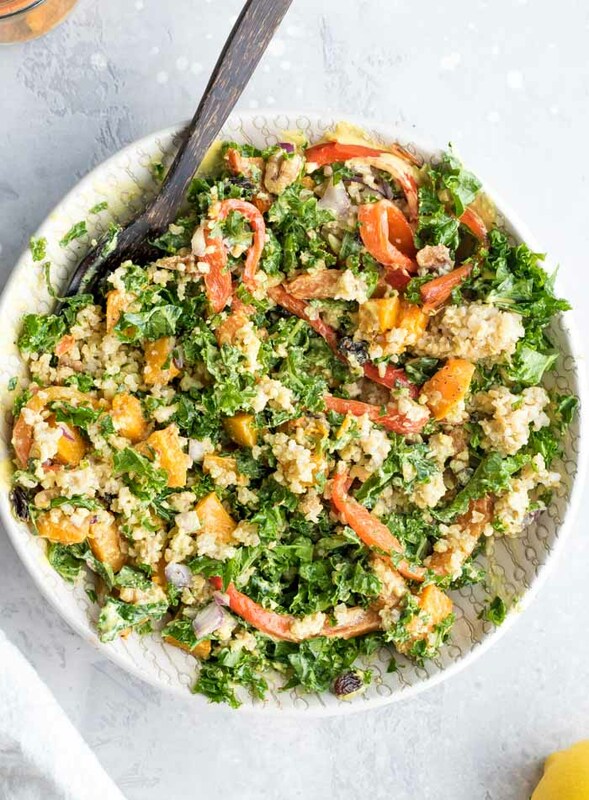 For meal prep, roast the squash and red peppers and cook the freekeh in advance or mix the entire salad ahead of time.It will keep in the fridge for up to 4 days and the flavours only improve the next day. Substitute any other whole grain for the freekeh. I would recommend farro, barley or brown rice. Substitute chopped dates, chopped dried figs, dried cranberries or chopped dried apricots in place of the raisins. Substitute pecans or almonds in place of the walnuts. Substitute any other cubed and roasted squash for the butternut. I would recommend acorn or kabocha. Roasted sweet potato would also work. I would recommend sticking to the kale for the green but you could use swiss chard or collard greens if needed. Kale Salad or Freekeh Salad? The finished salad won’t have as much kale as the photos. I loaded the bowl with kale just to fill it up. The second time I made it I didn’t use as much kale and I much preferred that version. 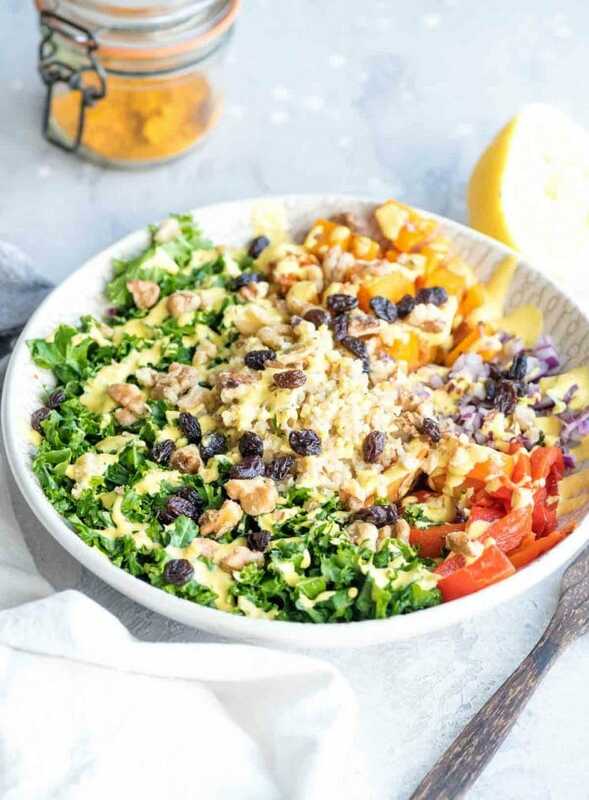 This salad has 17 grams of plant-based protein, 18 grams of fibre, 80 grams of carbohydrates and 17 grams of healthy fats. For micronutrients, contains 40% of your daily iron, 25% of your daily calcium and more than your daily vitamin C and vitamin A. It’s also high in magnesium, folate, zinc, manganese, B vitamins and a range of other essential vitamins and minerals in smaller amounts. Check out my vegan nutrition guide and guide to plant-based protein for more info on nutrition. This flavourful and healthy vegan freekeh salad is loaded with nutrition. It’s high in plant-based protein, works well for food prep, is oil-free and contains heart-healthy essential fatty acids. It can be made gluten-free by using brown rice instead of freekeh. Cook the freekeh. If you’re using uncooked freekeh, cook according to package instructions. If you already have cooked freekeh, you’ll need about 3/4 cup per serving or a heaping 3 cups. Roast the red peppers. Turn the oven on to broil. Line a pan with tin foil or use a silicone baking mat. Slice the red peppers in half, remove the seeds then smash them flat on the pan with the skin facing up. Broil on the top rack until they’re black and bubbling. Remove from oven and let cool to the touch while you prepare the rest of the salad. Once they’re cool, remove most of the peel using your hands then slice into strips. Roast the butternut squash. Pre-heat the oven to 400 F. Place the cubed butternut squash on a pan and sprinkle with salt and pepper then use your hands or a spatula to mix. Roast for 20 minutes then stir and roast for 20 more. Prepare the kale. Remove the kale leaves from the stems then take some time to chop it into very small pieces. Once it’s very finely chopped, drizzle it with 1/2 tsp of olive oil or avocado oil and a sprinkle of sea salt. Use your hands to massage the kale with the oil and salt so it’s all coated and darkened in colour. Prepare the bowls. There are two ways to prepare this salad. You can either prepare individual bowls or mix it all up in one big bowl. I like doing individual buddha bowl-style salads but either way is totally fine. 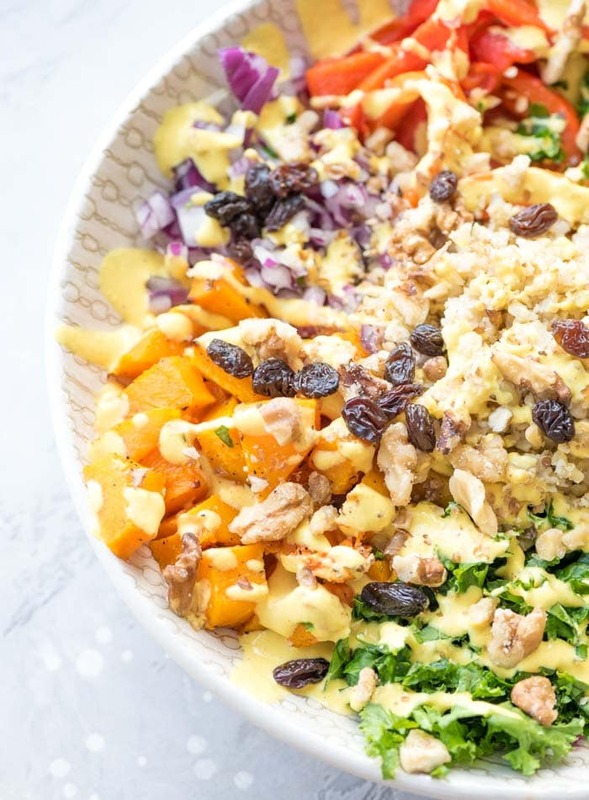 If you’re mixing up one big bowl of salad, add the cooked freekeh, roasted butternut squash, sliced roasted red pepper, diced red onion, kale, walnuts and raisins to a large bowl, otherwise, divide the ingredients amongst 4 bowls or containers. Make the dressing. 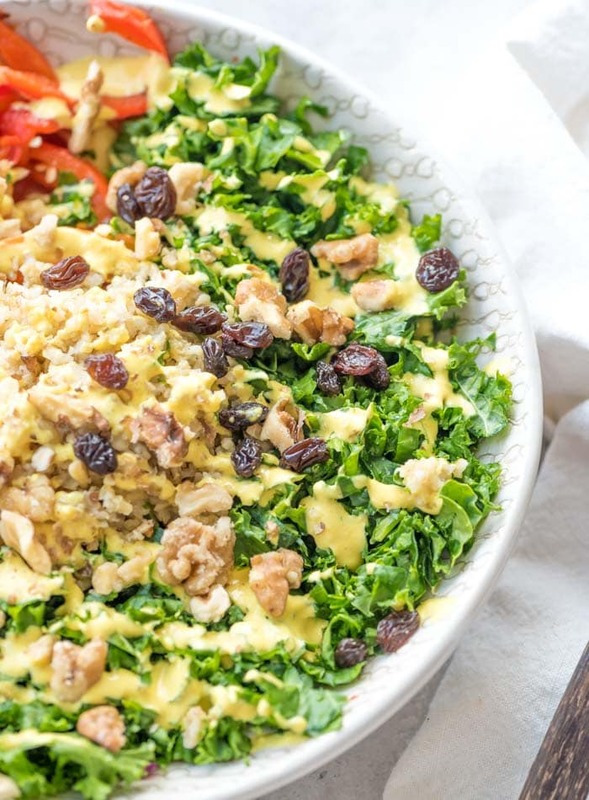 To make the dressing, blend all of the ingredients until smooth and creamy. You can add a bit of additional water to thin it out if you want but I like it on the thicker side. Add the dressing. If you’ve made one big salad, add the dressing and mix well to combine. If you’ve made 4 individual bowls, drizzle the dressing evenly over each bowl. Season with black pepper and serve. For the kale, you want 1 small handful per bowl/serving. To make this more of a kale salad rather than a freekeh salad, use 4-6 cups finely chopped kale. Love the beautiful colors of this salad! Looks so healthy and delicious! Yum!! I’ve been looking for some new salads to add to my menu. This one looks absolutely delicious! Freekeh is gluten free? All of my sources tell me it’s a source of wheat. Can you please clarify?